We are celebrating Lunar New Year with a family styled dinner! If you are born in 1935, 1947, 1959, 1971, 1983, 1995, 2007 or 2019 you match the twelfth zodiac sign of the pig. Look for lucky numbers of 2, 5, 8 and lucky colours of yellow, gray, brown. During this evening we are featuring a family tasting menu that is inspired by the Far East with our True North flavours. The menu is available for $39 per a guest, with a minimum of 2 guests for a booking. Reservations are recommended and regretfully, no substitutions can be made to the menu. The dinner will include soup sent as a first course, followed by the main course being the remaining four dishes to share. Our regular dessert menu will be available for those wanting a little bit more. Lunar New Year inspired Hennessy cocktails will be available all night long. This menu will be available on the evenings of February 1st, 2nd and 5th. Why is rye the king of grains? Join us for a three course dinner with cocktails pairings hosted by Belvedere Vodka Ambassador Sabrine Dhaliwal, to find out. Welcome reception at 6:30pm in our living room, followed by dinner at 7:00pm in the dining room. Ticket purchases include tax and gratuity. Regretfully, no substitutions can be made to the menu. Join us as we celebrate the season for gathering fruits, vegetables, family and friends. Each member of our culinary team will pair with one of our mixologists to create a bountiful three course dinner with local award winning hand-crafted spirits. Located on the “cowboy trail,” Eau Claire Distillery, has grown into an award winning spirit producer. With their philosophy of farm-fresh and ‘grain-to-glass,’ they make a perfect pairing to Chef Waters’ Canadiana inspired cuisine. Cocktails will explore the flavours of Three Point Vodka which is produced on the edge of the Rocky Mountains, Parlour London-dry style gin that reflects the great history of prohibition era gin parlours throughout the world, and a couple more farm to glass spirits within the Eau Claire portfolio. Tawse Winemaker, Paul Pender, will join Chef James Waters on May 9th for an exclusive three course dinner with wine pairings. We are celebrating Lunar New Year with a family styled dinner! If you are born in 1958, 1970, 1982, 1994, 2006, and 2018 you match the Chinese zodiac of a Dog. This zodiac moves in a 12-year cycle and those who are known as Dogs will have lucky numbers of 4 and 6, lucky colours of yellow, red and orange, but should avoid green and gray. During this evening we are featuring a family tasting menu that is inspired by the Far East with our True North flavours. The menu is available for $39 per a guest, with a minimum of 2 guests for a booking. Reservations are recommended and regretfully, no substitutions can be made to the menu. The dinner will include soup sent as a first course, followed by the main course being the remaining three dishes to share. Our regular dessert menu will be available for those wanting a little bit more. Email hello@kleinharris.com for inquires and reservations. We are doing Valentine's Day early this year! Surprise your whisky partner or friends with a Forty Creek Whisky dinner at K / H.
Welcome reception at 6:30pm in our living room, followed by dinner at 7:00pm in the dining room. Ticket purchases include tax and gratuity. Join us as we ring in 2018 with $5 Cîroc cocktails all night long! Each ticket will include canapés and a welcome cocktail. Book dinner with us on NYE and receive complimentary tickets to the event. 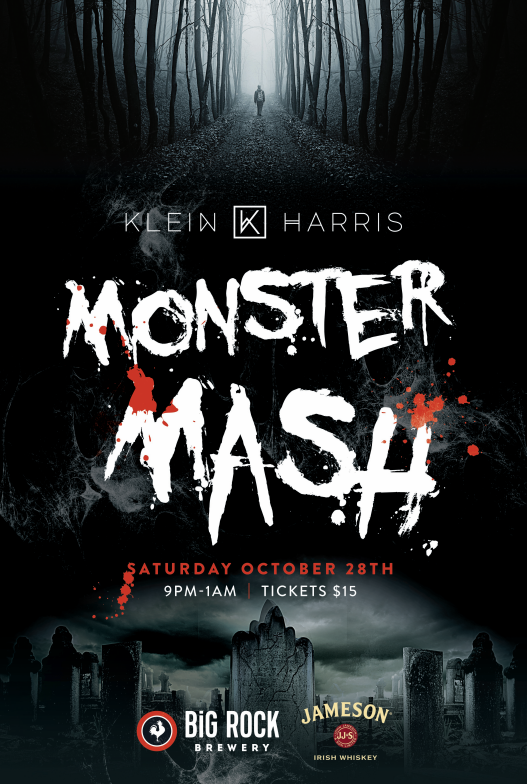 Join us for the Monster Mash at K / H. Come in your best dressed costume to enjoy music, good company and $5 feature Big Rock Brewery Beers and Jameson Cocktails. Ticket purchase will also include one welcome cocktail. Did we mention that we have a prize package for best dressed! Let's make the spooky magic happen! Join us as we celebrate the season for gathering fruits, vegetables, family and friends. Each member of our culinary team will pair with one of our mixologists to create a bountiful four course dinner with gin based cocktails. The dinner will focus on Colossal Pink Gin and the Forester Single Malt Oak Aged Gin from the distillery. 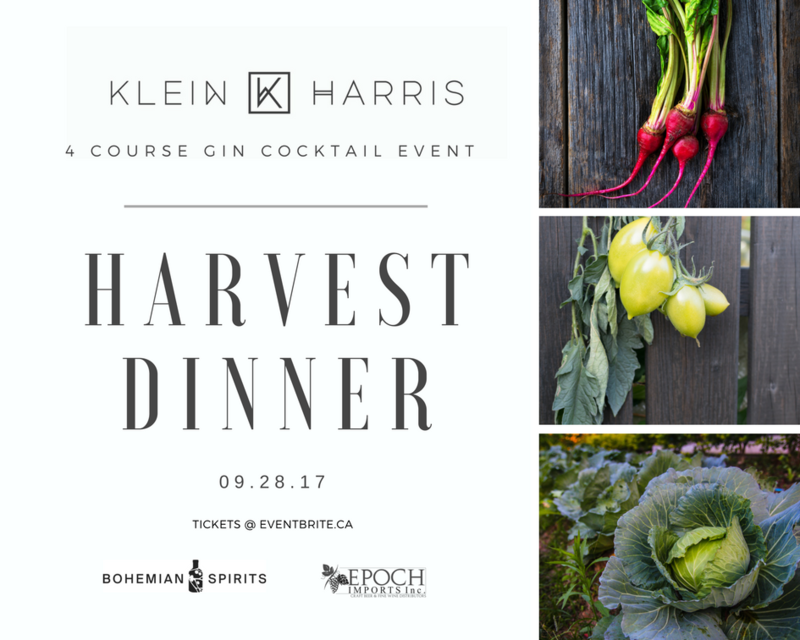 During this gin focused dinner you will meet, Wade Jarvis, the founder of Bohemian Spirits. Bohemian Spirits is located in Kimberley, BC and has been in operation since the start of 2015. The distillery uses local wheat from Creston BC as the base for all of its products so far, and also sources local juniper for the gins. Celebrate the great ones with a four course dinner inspired by Chef James Waters. Each course will also be paired with a Wayne Gretzky Whisky cocktail created by our innovative team of mixologists. Tickets are $150.00 inclusive of tax and gratuity. Support your local cocktail artisans by voting for your favourite Ginapalooza cocktail and enjoy gin! Visit local cocktail makers listed here www.ginapalooza.com. Passports available at participating venues. In support of Alberta local business, agriculture and charity, Alberta burger week takes place from May 6th - 15th. Visit participating venues and order within the 3 categories: $10, $15, $20. Choose your favourite and vote. More information on Alberta Burger Fest 2016 can be found here www.albertaburgerfest.ca. Made With Love comes to Calgary once again to celebrate the cocktail culture in our city. Come join us as we host the qualifiers on Monday, April 18, 2016. Check out www.enjoymadewithlove.com for more information. Welcome to K / H - the doors are open! Today marks the day that we will be opening our doors to the public! We will be open for dinner at 5pm this week with lunch service starting the following Monday.